Earn up to 1,840 reward points. This versatile octave fuzz delivers everything from classic distortion to otherworldly tones. 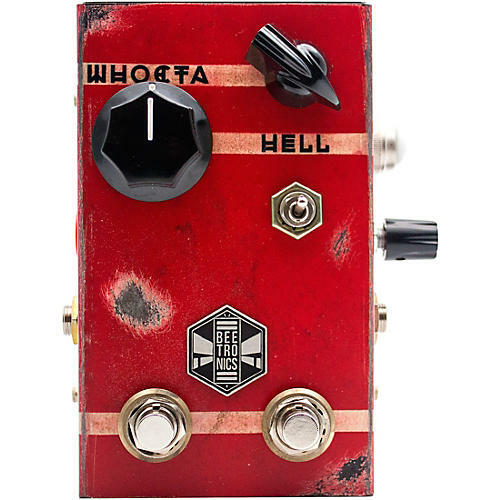 The Beetronics WhoctaHell is a low octave fuzz, with fully independent controls for the fuzz and the octave. It’s an overdrive/fuzz summed up with a gnarly squared wave low octave, resembling a 8-bit bass synthesizer. It’s octave has a range of one or two low octaves, selectable by a toggle switch and also has its own separate bypass switch. The OD/fuzz and octave work fully independent and used separately, but the magic really happens when you start blending them together and finding your sweet spots. You can create a large range of tones, that can be used on many different ways. It’s up to you to choose bee-tween an indie rock lead, a bass synth or an '80s video-game-sounding tone! No matter what you are into, the WhoctaHell will inspire you to create new music.